Apple pectin supplements may be useful for lowering cholesterol, slowing the rate at which your body absorbs sugars, keeping you regular and even fighting cancer, according to Fiber Ingredients by Susan Sungsoo Cho. 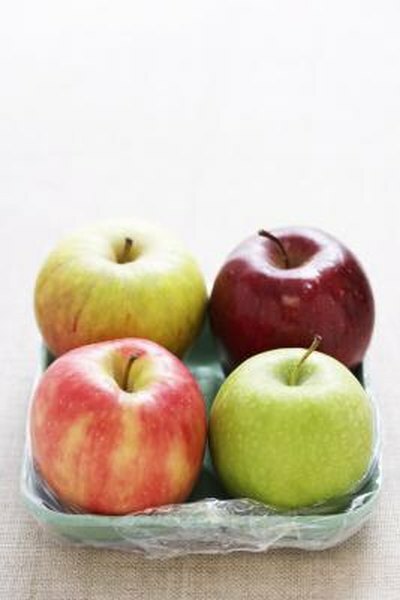 Apple pectin is a source of fiber that comes from plant-cell walls. Always consult a doctor before trying a new supplement. Apple pectin, a form of fiber, can help keep you regular if you suffer from constipation. Fiber supplements lessen constipation by making your stool soft. However, you must drink plenty of fluid if you take an apple pectin supplement because increasing fiber without enough fluid can actually worsen your constipation. Also consult a doctor before adding apple pectin supplements to your regimen if you have intestinal problems or take medications; fiber can slow absorption of medications. Apple pectin supplements can help control your blood-sugar levels, says Cho. Pectin works by slowing your digestion of sugars and fats, Cho notes. This leads to lower blood-glucose levels and a reduced insulin demand. This may make apple pectin useful for controlling diabetes, though you need to consult a doctor before using apple pectin for this purpose. If you take diabetes medicines such as insulin, your doctor may need to adjust your dosage due to the fiber’s ability to lower blood-sugar levels. If you need to lower cholesterol, apple pectin may be helpful, says A. Stewart Truswell from the human nutrition unit at the University of Syndey, Australia, and author of a commentary published in the American Journal of Clinical Nutrition. In fact, pectin works better than oat bran, psyllium or guar gum for this purpose, Truswell says. In comparing apple to orange pectin, researcher M. Gonzalez found the apple variety worked best for blood cholesterol. Gonzalez is the lead author of a study published in the Journal of Physiology and Biochemistry. Apple pectin supplements may be useful in protecting against or fighting colon cancer, says Cho. One reason is that it speeds excretion, which helps your body get rid of cancer-causing substances more quickly. Pectin also might work by binding to certain proteins that help spread cancer, which may slow or reverse the spread of cancer cells, notes Dr. Ray Sahelian of Los Angeles. Pectin may be useful in fighting other forms of cancer as well, such as prostate cancer, notes Crystal L. Jackson, lead author for a study published in the journal Glycobiology. However, more studies are needed to see how this benefit, mainly demonstrated in laboratory and animal studies, might translate to people. PubMed: Journal of Physiology and Biochemistry: Effects of Orange and Apple Pectin on Cholesterol Concentration in Serum, Liver and Faeces; M. Gonzalez et al. Oxford Journals: Glycobiology: Pectin Induces Apoptosis in Human Prostate Cancer Cells: Correlation of Apoptotic Function With Pectin Structure; Crystal L Jackson et al.